If you’re considering offering Aerial Yoga at your location, it makes sense to host your own Unnata® Aerial Yoga Teacher Training, just for you and your teachers. If you’re thinking about offering Aerial Yoga at your studio, or looking to train more Aerial Yoga teachers to deliver outstanding aerial yoga classes at your location, we can help. Let us bring an Unnata Aerial Yoga teacher training to YOU. As a studio owner, we know you’re busy, and dedicated to the success of your business. You want committed, qualified Aerial Yoga teachers to fill your class schedule – and you can’t do it all alone. You could send your teachers to one of our scheduled Unnata Teacher Trainings, or we can make it easy for you, and bring the Unnata TT to you! Let us come to your location and train your teachers in the most authentic and innovative method of Aerial Yoga in the world today. Additionally, once you’ve completed the Unnata Teacher Training, you will also get ongoing support as you expand your Unnata Aerial Yoga business, and strengthen your teaching technique. We offer continuing education, marketing resources, and an active community to help you grow. Michelle Dortignac, founder of Unnata Aerial Yoga, will work with your budget, your studio’s scheduling needs, and your desired exclusivity level so that you can choose the highest-quality and most comprehensive Aerial Yoga training available today. Bring the Aerial Yoga Teacher Training to you, and you’ll save on travel expenses, accommodation, and spare yourself the hassle of trying to manage your Yoga studio from a distance. Michelle Dortignac, founder of Unnata Aerial Yoga, has facilitated Unnata Aerial Yoga teacher trainings all over the world, and taught Unnata Aerial Yoga classes since 2005. She created and refined the method from her 25+ years of Yogic studies and aerial arts training. Michelle Dortignac’s Unnata Aerial Yoga Teacher Training is the most thorough and professional Aerial Yoga teacher training anywhere in the world today. And now you can bring it to your teachers, in the comfort of your studio. Why Offer Unnata Aerial Yoga at Your Studio? Be the best Aerial Yoga studio in your area. Aerial Yoga is rapidly growing in popularity, but few teachers have the depth of insight to teach authentic Yoga with the support of the hammock. The Unnata teacher training educates instructors to deliver a true Yoga class, that emphasizes breath, alignment, and integration with floor asana, not just flips and pretty poses. Looking for the perfect niche to differentiate your studio? Unnata Yoga helps you rise above the others. Introduce a new slice of the population to your studio, and to the benefits of Yoga. Aerial Yoga appeals to more than just dedicated yogis. Many who come to an Aerial Yoga class have never tried Yoga before! You can expand your reach and attract a whole new clientele: they’ll come for Aerial, but stay for Yoga. Unnata Yoga revitalizes a studio, enhances all your offerings, and creates devoted students. Not only will your Unnata Aerial Yoga classes thrive – the enthusiasm generated will energize your entire studio – students, teachers and classes. With Unnata Aerial Yoga, you have choice. Although we believe after taking this course you and your teachers will be proud to call yourself Unnata instructors, the beauty of this program is that your studio maintains autonomy. Unnata is not a franchise: there is no obligation to name your Aerial Yoga classes “Unnata” classes, there are no prescribed sequences you must adhere to, and there are no royalty/franchise fees. We simply offer thorough and professional training on how to teach Yoga with this new and powerful Yoga assistance tool. Unnata Aerial Yoga is a carefully developed method of Hatha Yoga that uses the support of the hammock to refine a traditional Yoga practice. Our teaching is rooted in classic Yoga, which means Unnata Yoga is a perfect complement to your regular class schedule. It’s both a fun, engaging way to introduce new students to Yoga, and a powerful tool to help your committed students advance their practice. Your teachers will learn the subtle mechanics of working with bodies in multidimensional space, and apply their wisdom to how they teach regular Yoga, too. With Unnata Yoga, you can safely guide students into asanas that may have been beyond their reach before – deeper backbends, real inversions, stronger balancing poses – and then transfer these same mechanics to traditional floor asanas also. Your students can rapidly progress their practice, creating stability and ease, strength and release, as you highlight distinctions in asana that can only be realized while suspended in the hammock. You will also learn to guide your students into more subtle awareness of breath, bandhas, koshas, sutras, and deeper teachings of the Yogic tradition. Some Aerial Yoga styles emphasize feats of acrobatic athleticism, and you might spend an hour upside down in knots. If your studio seeks a circus-centric style of Aerial Yoga, we may not be a match for you. But if you’re looking for pure Yoga, uplifted, we’re here for you, and we can train your entire team in this elevated method of Yoga. And, if you already offer Aerial Yoga at your studio, and you’re seeking a more authentic and integrated Yogic approach to Aerial asana, we’re available to help you advance. In fact, many studios have hired us to re-train their teams after a previous Aerial Yoga teacher training left them hanging. Our immersive Unnata training curriculum delivers the knowledge you need to offer a true Yogic experience, both on the ground, and in the air. Read more about our Unnata Training Program here. Our Start-Up kit includes all the tools you need to promote your studio & classes with the Unnata reputation. We give you access to downloadable, printable, and web-ready materials, including: Unnata logos, images, videos, and text, which you can use to show your students what your new Unnata classes are all about! You and your teachers will all be included in our Teacher Registry. And you also have the choice of featuring the Unnata classes at your studio on the Unnata website’s “Find a Class Map.” You can feature your own photos, website, class descriptions, and directions to your studio, plus more! Our dedicated Members Area of the Unnata website features a wealth of continuing education resources. Michelle Dortignac continuously adds new tips and insights about the method through her “Unnatips” video series, and more. Plus, you can gain access to full-length Unnata video classes that you can use as a teaching template. With your Unnata Aerial Yoga license, you’ll also get access to an international community of teachers who will be there to support you beyond the initial training: they’ll share their creativity, and answer your questions about rigging, safety, special student cases, and more. When you’re ready to offer Unnata Aerial Yoga at your location, we’ll work with you to train your teachers and support your Unnata business in taking off. We’ll address your specific needs, and cater the training to your team. When you host an Unnata Yoga teacher training, you can choose to keep it private, just for your own teachers, or you can make it public, and invite outside teachers to join. We also offer the option to host joint trainings with another non-competing studio. In a private training, we will work exclusively with your teachers. We can flex the training times around your studio’s schedule so you don’t need to cancel classes. You’ll need 4 students minimum to host a private training. The more bodies your teachers observe in training, the greater their ability to help a wide range of students in your studio. If you don’t have the minimum required students, but still want to train your teachers at your location, we can open the course to the public, and invite outside teachers to participate. This way you get the teachers you need, in the comfort of your own studio, and you get a percentage of the tuition for outside students, which makes the training more affordable for you. Maybe there’s another studio in your region that’s inspired to offer Unnata Aerial Yoga – far enough not to be your competition, but close enough to become an ally. We can conduct a training for both your studios – either at one location, or split between the two, so you both get qualified teachers. Our team can help make connections with other Unnata studios in your region. Our Unnata Aerial Yoga training is 8 days, but we can arrange those days to accommodate your schedule. We can train your team in a single 8-day immersion, or break up the course into two, or even three segments. When necessary, we can increase the length of the course to accommodate shorter training days (so you don’t have to cancel regularly scheduled classes), or to accommodate more than 7 participants. Aerial Yoga has taken off, and students everywhere are energized to elevate their traditional Yoga practice. Enhance your studio and attract more students by offering Unnata Aerial Yoga at your location. Let us train your teachers, and we can help you set up your studio as the trusted source for Aerial Yoga in your area. 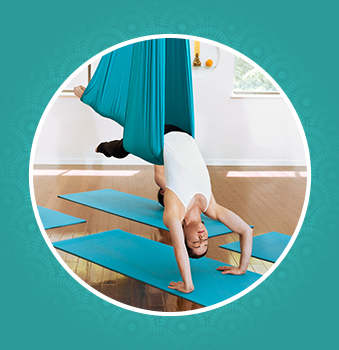 Curious about hosting an Unnata® Aerial Yoga Teacher Training for your studio? Let’s set it up and soar. Contact Us!